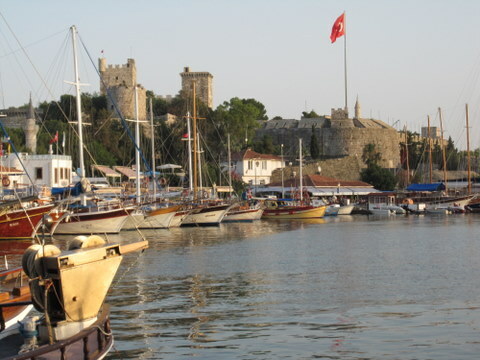 For latest information on What to do in Bodrum click here. Flights from the UK have a nasty habit of arriving into Bodrum-Milas airport at about 4am, but once you’ve picked up your luggage, collected your hire car and are approaching Bodrum on your early morning drive, you’re soon reminded why you’ve put yourself that joyless night-time ordeal. The sun’s been rising behind you as you’ve driven along the coastline dotted with tiny islands, but now the road bends almost 270 degrees and as it descends you are afforded your first glimpse of Bodrum: the 14th century castle of St Peter with a vast marina as a backdrop and beyond just that deep, deep blue of the Mediterranean. On the hillside opposite there’s a mass of white dwellings. In the dawn of a summer day there’s no heat haze – it’s perfectly clear. It almost seems worth the sleepless night. Bodrum is the largest town on the peninsula and is about 25 minute drive or 35 minute dolmus ride* from our villa in Gumusluk. Bustling and colourful, Bodrum is renowned for its shops, bars, restaurants and nightlife as well as its impressive marina and the town’s undoubted focal point, the beautiful St Peter’s Castle. For shopping the main bazaar lies in the pedestrian precinct, at the foot of the castle. Little shops of every sort abound in all the narrow streets; many sell leather goods, pottery and carpets. You have to bargain in Turkey (all in good humour) – take off about a third of the price they say or plead poverty: it’s all a game! On Tuesdays there is a massive fabrics and clothing market beside the bus station and on Thursdays and Fridays there is a food market here. This entry was posted in Activities, Bodrum and tagged Bodrum, Bodrum Peninsula, Holidays, Travel, Turkey, Turkish Villa, Vacations, Villa rental by Paul Smith. Bookmark the permalink.